The passion to create, blended with perseverance, endurance, and nurturance are the ingredients for intrapreneural success. Perhaps you have been dreaming about becoming an entrepreneur but were afraid of the risk. Intrapreneurship may be the Right Fit for you! A person, within a mid sized or large corporation, who is the catalyst for an innovative product, system, or service. In some instances, that person creates a company within a company and assumes the executive leadership role. Corporate entrepreneurs are referred to as intrapreneurs – they function as entrepreneurs inside a company. Peter F. Drucker, legendary management thinker, originally coined “intrapreneurship,” which was officially defined in dictionaries in the 1990’s as a result of its popular usage. How does a company set the stage for intrapreneurs to flourish? They make you feel you belong; you are a member of the community, not just an employee. They encourage creativity, give you freedom, and provide financial support. Google, for example, enables their employees to spend 20% of their time working on any project of interest, even if it is not related to their current job. Intrapreneurship is not only prevalent in other tech companies, including start-ups, but also in other industries. Who built a gigantic company, founded in the 1920’s, by nurturing Corporate Entrepreneurs? Walt Disney, of course! He adored his imagineers and fostered their intrapreneurship. 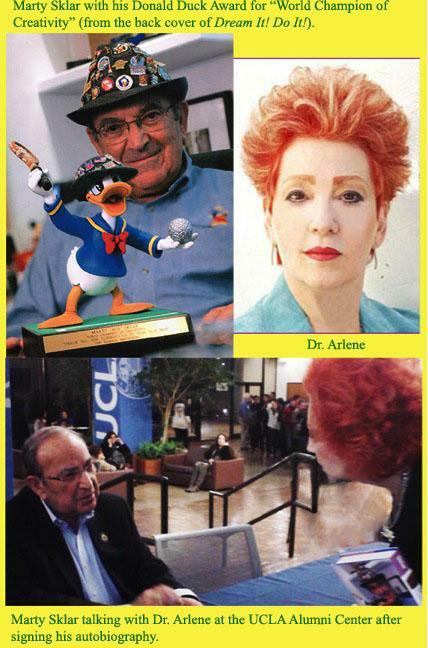 I met Disney legend Imagineer Marty Sklar on Wednesday evening, January 22, 2014 at the UCLA Alumni Center, where he spoke about his career and signed his book Dream It! Do It! Sklar joined Disney in 1955, one month before Disneyland opened. He started working with Walt Disney when he was a junior at UCLA and became his right-hand man. In 1960, he moved on to what became Imagineering – the blending of creative imagination and technical know how – and ultimately he became the president of Imagineering. During his 54-year journey at Disney, Sklar was a creative force in the development of 11 theme parks globally. As he said in the acknowledgements to Dream It! Do It!, Imagineers “made it sing and dance,” and so they did under the leadership of Vice Chairman and Principle Creative Executive Marty Sklar, corporate entrepreneur extraordinaire! Using Dr. Arlene's Right Fit Method, they work together to achieve the leaders' dreams. You would be amazed how often obvious opportunities for intrapreneurship are never seen. Are you missing opportunities? Eager to learn more about intrapreneurship and find out if it is the Right Fit for you? Call Dr. Arlene (310) 443-4277 to arrange a time to speak. For more information on the upcoming event and an invitation, email DrBarro@WinWithoutCompeting.com. Your response will receive our personal attention.